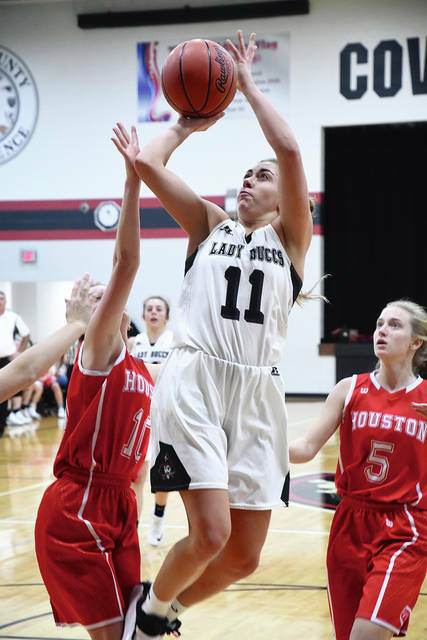 Ben Robinson|GoBuccs.com Houston’s Amber Stangel shoots over Covington’s Claudia Harrington. Ben Robinson|GoBuccs.com Houston’s Hollie Voisard drives against Covington’s Morgan Lowe. 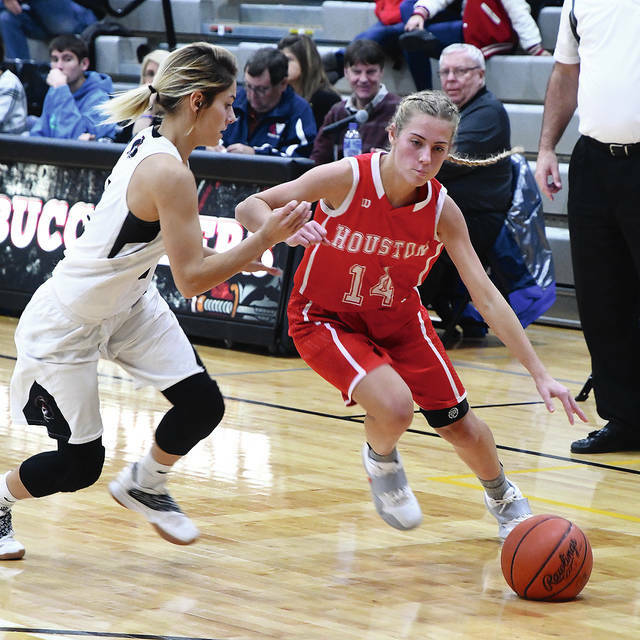 Ben Robinson|GoBuccs.com Covington’s Morgan Kimmel pressure Houston’s Amber Stangel. Ben Robinson|GoBuccs.com Covington’s Sammi Whiteman shoots between Houston’s Amber Stangel (10) and Sammie Miller (5). 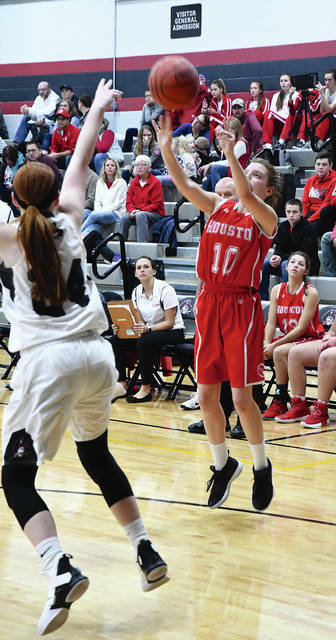 COVINGTON — It was a typical opening half of the girls basketball season Friday night, with both Houston and Covington trying to find the shooting range in the opening half. But, Covington was able to stretch a 22-9 halftime lead to 44-14 after three quarters and posted a 52-27 victory. Covington was 10 of 16 from the floor in the third quarter, after hitting just 10 of 35 shots in the opening half. And a big part of that was Sammi Whiteman. 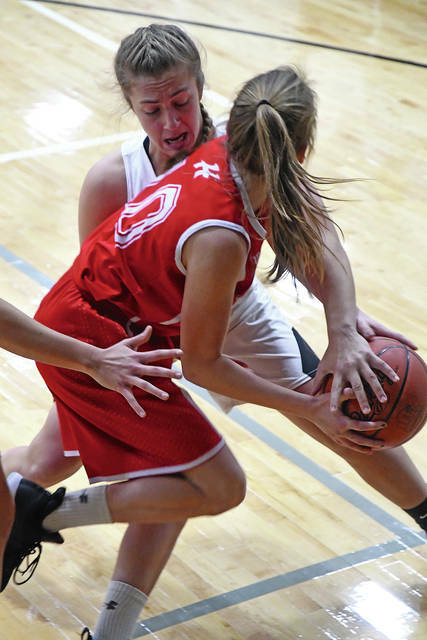 After two baskets by Morgan Kimmel, Whiteman hit six of eight shots in the quarter, including two 3-pointers as she scored 14 points in the quarter and finished with 27, despite not playing in the fourth quarter. And Whiteman understood it was a big game for the entire Buccs team, who has just three players with a lot of varsity experience. Houston coach Brad Allen knew slowing down Whiteman was going to be a tough assignment. Houston finished just two of 20 from the floor in the first half and never really got untracked. And Covington converted on enough opportunities in the first half to open a double-digit lead. But, the Buccs owned a big rebounding advantage all game. Freshman Makenzee Maschino led the Buccs with 15 rebounds, while Whiteman had 10 and Kimmel had nine. Kimmel also added seven points on offense despite going up against much taller opponents. Addie White led Houston with eight points. Covington was 23 of 63 from the floor for 37 percent and three of eight from the line for 38 percent, while Houston was seven of 48 from the floor for 15 percent and 11 of 15 from the line for 73 percent. Covington won the battle of the boards 47-16 and had 10 turnovers to Houston’s five. Covington will play at Fairlawn tonight, while Houston will host New Bremen Thursday. Amber Stangel 2-2-6, Addie White 3-0-8, Hollie Voisard 0-0-0, Jess Monnier 0-6-6, Hayden Riesenbeck 0-0-0, Mariah Booher 0-0-0, Catryn Mohler 0-0-0, Sammie Miller 1-3-5, Megan Maier 1-0-2. Totals: 7-11-27. Morgan Lowe 1-0-2, Sammi Whiteman 12-0-27, Morgan Kimmel 3-1-7, Claudia Harrington 0-0-0, Lauren Christian 2-0-4, Lillian Hamilton 2-0-4, Makenzee Maschino 1-2-4, Brenna Miller 1-0-2, Leah Poling 1-0-2, Autumn Rich 0-0-0. Totals: 23-3-52. 3-point field goals — Houston: White (2). Covington: Whiteman (3). Records: Houston 0-1, Covington 1-0.
https://www.dailycall.com/wp-content/uploads/sites/30/2018/11/web1_houston-10.jpgBen Robinson|GoBuccs.com Houston’s Amber Stangel shoots over Covington’s Claudia Harrington. https://www.dailycall.com/wp-content/uploads/sites/30/2018/11/web1_houston-14.jpgBen Robinson|GoBuccs.com Houston’s Hollie Voisard drives against Covington’s Morgan Lowe. https://www.dailycall.com/wp-content/uploads/sites/30/2018/11/web1_morgan-kimmel.jpgBen Robinson|GoBuccs.com Covington’s Morgan Kimmel pressure Houston’s Amber Stangel. https://www.dailycall.com/wp-content/uploads/sites/30/2018/11/web1_sammi-whiteman.jpgBen Robinson|GoBuccs.com Covington’s Sammi Whiteman shoots between Houston’s Amber Stangel (10) and Sammie Miller (5).